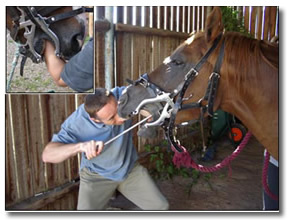 Sharp points occur in most horses teeth over time due to uneven grinding and wear on the horses’ molars while eating. The equine dentist will float your horses teeth (rasp or file the teeth) to even the tooth surface and ensure it is at the proper angle. Why The Equine Dentist Continues Floating Horse Teeth. Floating removes sharp enamel points on the tooth. These enamel points can cause considerable discomfort to the horses’ cheeks, gums and tongue. without removal these sharp points can give rise to health problems as outline below. The most common tools used are the floats. These are long handled rasps that are designed for filing down horse teeth, hence floating horse teeth. 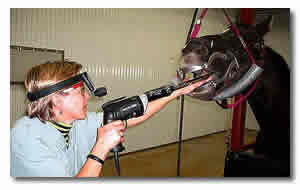 The floating horse teeth procedure is one aspect of a complete dental examination. A full evaluation of your horse’s teeth should be carried out annually by a qualified equine dentist and, in some cases a more frequent examination is necessary. The clinical signs of dental disease are varied. Some horses show obvious signs of pain and discomfort while others may adapt to the discomfort without showing you any signs of dental problems until they become severe. Common Signs of Equine Dental Problems that may require floating the horse’s teeth.